The VideoWhisper Live Streaming software can now be easily used to add video broadcasting to WordPress sites and live video streams on blog pages. To test a live demo of software on WordPress, just register a free account on this site and use the widget link from the right menu to start broadcasting. If the user is not logged into WordPress a warning message is shown and the visitor can click that to get back to the main WordPress website for registration/login. We also included a plugin that provides a linking widget. 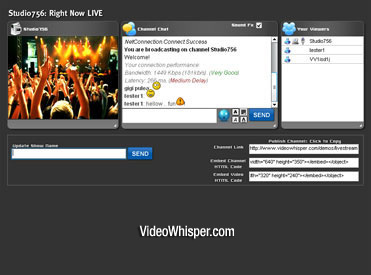 You can use that or directly add a link to “http://www.your-site.com/videowhisper_streaming/” . The widget also displays online broadcasters and their show names. The watch screen logs in wordpress logged in users by adding a @ at end of username (so broadcaster can see & test his own video as a different user). 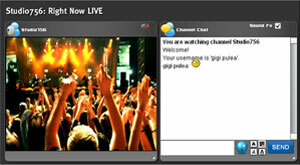 Blog visitors will be able to participate in chat by providing a temporary username right in the chat application. A free version of this component can be downloaded for free from the WordPress Live Streaming Software page. 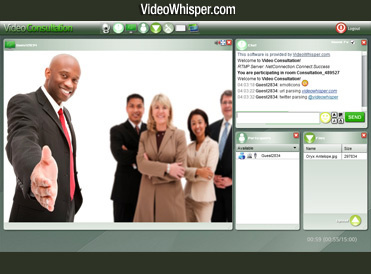 VideoWhisper.com released a Red5 open source version for the RTMP application serving the VideoWhisper projects. This can be downloaded from the downloads section including java source code and eclipse project files. Application was tested with Red5 v7 Final. Red5 is a free, open source, Java based, alternative to Adobe’s Flash Media Server. To install Red5 you need a dedicated server. You can not install Red5 on a shared hosting plan. Red5 is available both for Windows and Linux servers. Red5 is the free solution to host RTMP if you have your own dedicated/semi-dedicated server or VPS: Download Red5 v7 Final . VideoWhisper provides managed plans with full installation and setup including premium rtmp hosting with dedicated ip, free installation of video streaming software (including standard fantastico scripts like wordpress/joomla), unlimited connections on Red5 starting from 10Gb space and 200Gb bandwidth at $50/month.